With busy schedules, not everybody has time to keep up with the news, but that doesn't mean it's not important to them. If you are initially reading about some event that has been going on for a few weeks, then there is bound to be a lot of confusion. The articles reference previous related events, changes in information, etc. We wanted to have a way to quickly catch yourself up on a topic by searching for related articles, and easily seeing when it began trending, and how the topic has evolved since its inception. We saw the Thomson Reuter API as a useful resource on this matter, and have used it as our source of news that we filter and organize. Features: Interactive timeline. 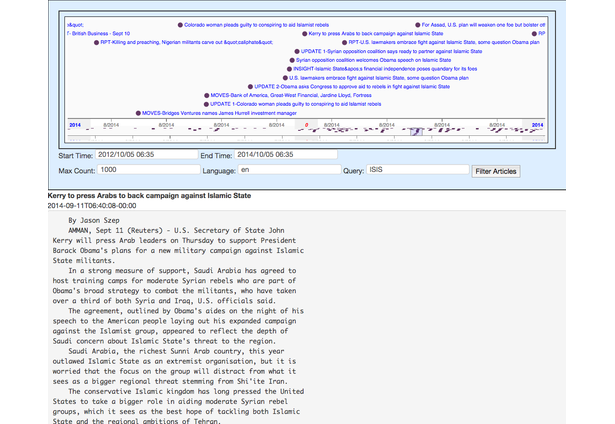 Shows overall view based on chronology, and you can select a window to zoom into to see individual news articles. Clicking on the article loads it into the area below so it can be read / skimmed easily before moving onto the next article. Additional member: mikefu@mit.edu (no challengepost account at time of submission). Comments for this submission are closed. View the software in mmark's portfolio to continue the conversation.